Inserting FLV to a PowerPoint helps make a better, more appealing and more interesting presentation. Unfortunately, FLV is a native document file created by Adobe Flash program, in the form of .f4v and FLV format, which is incompatible with the PowerPoint and cannot be attached to a PowerPoint directly. However, the PowerPoint supports many other file formats such as AVI, WMV, and many others. Therefore, the practical way to attach an FLV video to a PPT is converting them to other formats that can be inserted to the PowerPoint directly. This article has outlined four effective ways of attaching FLV to PowerPoint slide including converting files to compatible formats using Wondershare UniConverter (originally Wondershare Video Converter Ultimate). Step 1 Insert any object that can be edited to the PowerPoint. You can insert a dialog box, an image or a shape. Step 3 After clicking “Hyperlink,” you can add or paste the URL of the FLV video that you want to link. Step 4 Click on the object with the video links, and once you do that, a new browser will pop up and take you to the page where the video is to be played. Step 5 You can get the URL of the FLV video by copying the video address from the YouTube address bar. Wondershare UniConverter (originally Wondershare Video Converter Ultimate) is the best solution to FLV conversions. It helps convert FLV to PowerPoint compatible formats such as AVI, MPEG, WMV and many others. The converter is effective in retaining the original quality of the video file, and it converts at a speed which is 30 times faster than other converters. Apart from converting FLV video files, the Wondershare Ultimate converts other files such as MOV, 3GP, WMV, MKV, MP4, VOB and many other video and audio files. 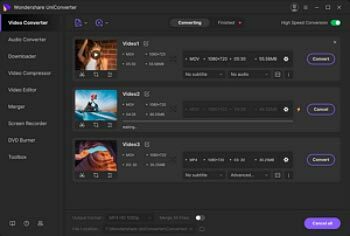 The tool has a preview and editing option, and you can preview and edit your video file before conversion. Launch Wondershare Converter on your computer. Then add the FLV video file that you want to convert. Click “Add Files” for Windows or “File >Load Media File” for Mac. Alternatively, drag the FLV file and drop it into the window of the app. Go to the “Output Format” and then from the “Format” option click “Videos” all the supported video output formats will be displayed. Choose WMV, AVI or MPEG or any other file format that can be attached to a PowerPoint. You can also edit the FLV file by clicking the “Settings” option to crop, rotate, change brightness, volume, or add special effects to your video file before converting it. Click the “Convert” button to start transforming your FLV file. The conversion will be over in few minutes, and you can now add the converter FLV file to your PPT. You can embed FLV files by installing some add-on tools such as PowerPoint to Flash Converter PPT2Flash. Step 1 To add the PowerPoint to Flash Converter PPT2Flash, just open the PowerPoint. From the toolbar, you will see an extra “PPT2Flash”. Step 2 From the toolbar, click “Insert Flash”. 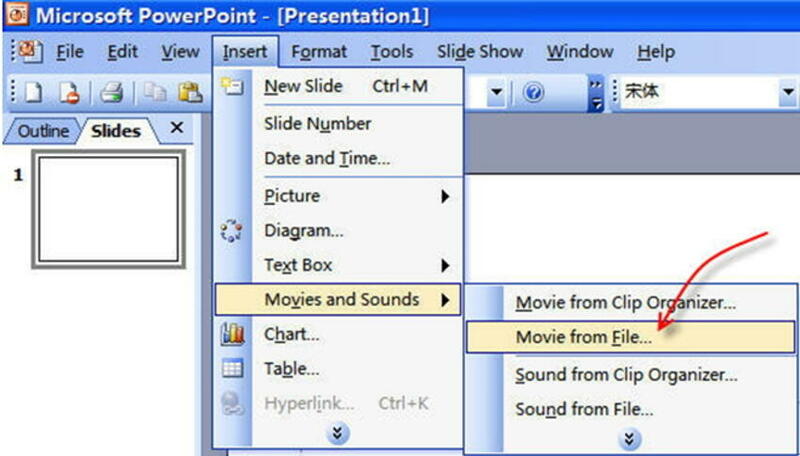 Then, select that FLV file that you want to put into the PowerPoint slide. 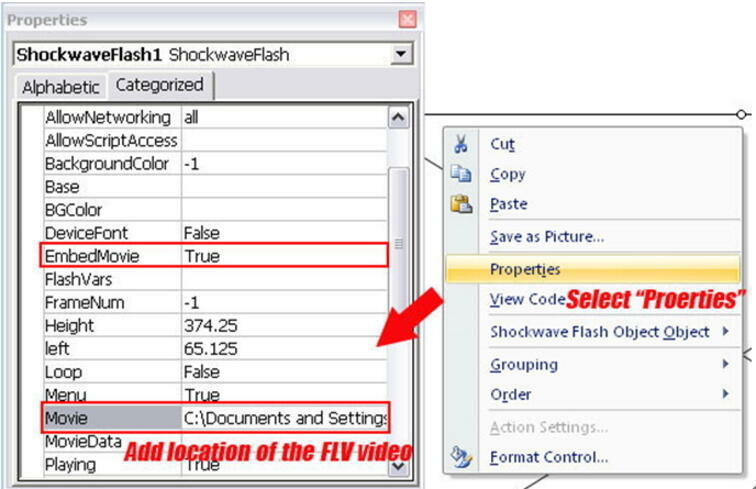 Step 3 For you to preview the added FLV video, you can press the F5. Step 1 Open the PowerPoint on your computer. From the PowerPoint options, click on “New Slide” to open a new slide where you will place the FLV video that you wish to add. Step 2 Go to the top toolbar and then select “Developer.” After clicking the “Developer” option, choose “More Controls.” A small dialog window will be presented. 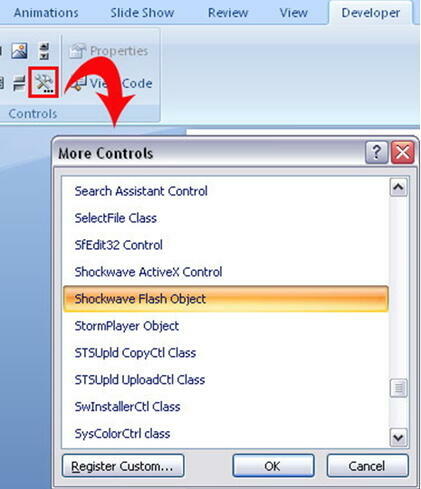 From the dialog window find the “Shockwave Flash Object”. Step 3 Make a rectangular box on the opened slide. After drawing the box, right click on it and from the options that will be displayed, choose “Properties”. Step 4 Go to the item “Movie” and then fill the blank space by entering the link address or the location of the FLV video. Then close the properties bar after inserting the information. Step 5 To preview the FLV video in the PowerPoint, press the F5. Generally, there're 2 options for you to insert converted FLV file to PPT. Open the target PowerPoint file on your computer. Go to your video files and then select the converted FLV file to add it. Click “OK” to confirm. A dialog box will pop up. From it, choose whether to play the video automatically. You can preview the video by clicking the F5 button. Open the PPT file where you need to insert the FLV video. Click the “View” option, then go to the “Toolbars”, and hit the “Control Toolbox”. Click “More Controls” for further actions. Drag the video screen area with the “+” icon. Right click on that area, and from the many listed options you select “Properties”. From the “Properties” window, insert the location path of the video. You can also insert the URL in the URL box. Then you can input the video by clicking “Browse.” Uncheck “Auto Start” from the playback option to prevent the video from playing automatically. Click the “OK” button to verify your selection. Change the path of the video to the new path that you have put to ensure that your video plays smoothly. Note that the above description is based on PowerPoint 2003 and the Windows Media Player 9.0. The choices may vary depending on the version on your computer.